For the past nine years, the Durham West Arts Centre has presented the Studio Tour as part of its commitment to art education and support for local artists. For two days each spring, area studios and artists welcome the public to view artwork, watch demonstrations and learn more about various creative productions within the region. This event is an excellent opportunity for local artists and artisans to showcase and sell their work from their host studios and sites which may otherwise not be regularly open to the public. The tour is self-guided and free of charge for visitors. Application is open to all artists and fine craft artists living and working in the Durham Region or invited guests working within the region. 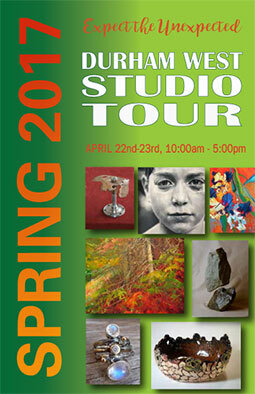 The Durham West Arts Centre Studio Tour is a juried event. Each year, the jury strives to achieve a fresh and interesting mix of new and returning artists and to include artists working in a variety of media. I’m a graduate of the Ontario College of Art and Design. I started painting 40 years ago. I worked as a graphic designer for 30 years and brought a renewed dedication to my art 15 years ago. I have exhibited in Toronto and Uxbridge and have been part of the Uxbridge Studio Tour for 4 years. I am a recipient of an OCA scholarship and a graduate of Queen’s University (BFA Honours). Upon moving to Uxbridge, I was emerged in the early formation of the Uxbridge Celebration of the Arts, past board member of the Latcham Gallery, instructor for Durham College, the Durham Catholic District School Board and am always actively pursuing my visual perspectives. “My paintings are a visual quest to explore connectedness through the medium of oils. My artwork is an exploration, to share with you my brief moments of Awe." Wendy Bermingham is a full-time artist and a graduate of the Ontario College of Art and Design. As an artist of the contemporary landscape, she delights in the abstract exploration of textures and the expression of movement while being sensitive to the patterns and colours of light. Working in oils, Wendy wants the viewer to see every brush of paint, to feel the motion of her palette knife but most importantly to see what she sees, the abstract inside the realism and the blurred line between them. Her style would be described as impressionistic realism. Wendy is an elected member of the Ontario Society of Artist (OSA) and The Society of Canadian Artists (SCA) and a member of the Ontario Plein Air Society, East Central Ontario Art Association and PineRidge Arts Council. Wendy’s work is in private collections across Canada and the United States. Amanda is a self-taught jewellery artist with an educational background in Archaeology and Anthropology. Cultural symbols are often present in her work and her rustic bronze, gemstone and silver jewellery-work is influenced by Viking and Roman artisans. Amanda has exhibited at several galleries and shows, including the Aurora Cultural Centre, The Rail’s End Gallery and One-of-a-Kind. Skills learned as a frame loom tapestry weaver and spinner have lead directly to a love of wet felt making. In recent workshops with Liz Clay from the UK (Gros Morne Park) AND Marjolein Dallinga from Quebec, I have learned numerous techniques used to transform 2D hand made felt fabric into 3D wearable art. Lela earned a Graduate Certificate in the Ceramics Program from the Haliburton School of the Arts as well as a Visual and Creative Arts Diploma from Sir Sandford Fleming College. Currently, Lela runs her own studio in Oshawa and teaches courses in ceramics in the GTA and actively participates in all events related to ceramics and arts. Cheryl Fulcher’s jewellery is art in metal. Growing up with the influence of invention and attention to detail, she has brought a flow and balance to her chain link necklaces and bracelets. Starting from various gauges of sterling silver, she hand winds wire into links making timeless classics and original designs. Her earrings are complimented by semi-precious stones. After being a perpetual night-class student in Jewellery arts at George Brown College for 16 years, Cheryl has now set up her own studio. Sarah is a self-taught artist educated in the discipline of Science. She is new to the world of art as a fine artist, but has enjoyed much success in the initial experiences publicly sharing her work including the Uxbridge Studio tour (2016). Her photorealistic hand drawings reflect her scientific mind. Born in the Netherlands, Hanneke grew up in an artistic family. She earned her Bachelors of Science and Education at the University of Toronto, specializing in Art and Special Education. After taking a leave, she pursued her love of Art by joining several art groups and taking many workshops. Her work has been accepted into many juried shows and has won several awards. “I work mainly in watercolours liking their transparency and unpredictability. Skies fascinate me. I am drawn to bright, deep colours and contrasts between light and shadow. I find inspiration everywhere, the shadows on my peonies, the scenery around norther Durham, my trips throughout Canada, and trips to Europe. Lis has been making art glass jewellery and art pieces on the torch and in the kiln for fifteen years. She also teaches her craft. She has participated in numerous art shows and high calibre studio tours. She has taken the leadership in these and in other arts organizations. “My kiln-fired glass becomes small, exquisite art pieces, both objets d’art from my own unique molds and functional dishes fired many times. Each torch-fired glass bead I create gleams and transforms into a tiny abstract sculpture with its interplay of colour and texture – unique art glass pendants or accents for pens and hostess gifts. Although primarily self-taught, Sue has studied at Southampton School of the Arts, Station Gallery, Haliburton School of the Arts and at the McLaughlin Gallery. Sue has shown in Centurion, South Africa, Kincardine, Durham and Rosseau. Her art is currently hung internationally in both private and corporate collections. I am a self-taught artist and business graduate from York University. I find glass incredibly beautiful. I’m fascinated with how glass interacts with light and how it captures the light’s living energy. It is constantly changing as the light changes around it. I started with tumbled glass, then coloured and stained glass, and now kiln fired. Some of my pieces are whimsical and bursting with colour and others are very calm, clear and structured. I’m highly influenced by nature, the changing seasons and my own environment. As I continue to learn, I continue to evolve and so does my work. Much of my inspiration comes from not knowing what I may be creating next, and the prospect of what can be created. The possibilities are endless. Tricia is a sculptor from Claremont, Ontario creating unique garden art. Having a love of gardening and a passion for art, she puts these together to produce pieces that will enhance the beauty of any garden. She is self-taught and takes great pleasure in turning recycled material into exceptional pieces, each with its own story. Courses in Fabric Art can also be taken in her studio. I’m self -taught. I grew up in my father’s workshop surrounded by tools and materials. I was given a free hand to express myself by fabricating and manufacturing my ideas using discarded items, offcuts, and other’s unfinished projects that I found around the workshop. 2015 was my first year as an Uxbridge Studio Tour site artist. Colin began drawing and sketching at a young age and never lost the excitement of representing what he saw with a pencil. He then explored paint, pastels, and many other materials. Self taught initially, he spent 10 years at OCAD developing his skills. Colin taught high school art for 30 plus years as well as religion and philosophy. After retirement he turned to painting full time and has shown his work in Stouffville, Port Perry, and Niagara. He has been a member of the WSST and DWST for several years.